The Nutritional Essentials Group creates personalized Nutritional Education content for your website, printouts for your office, and many other solutions to make educating your patients a more efficient and cost effective process. Newsletters are Essential but time consuming. Many Health Care Specialists who are intrigued by the thought of starting a newsletter soon notice that writing a newsletter themselves is very time consuming and difficult to repeat month after month. The research, writing, editing, focus grouping and publishing is time consuming and expensive. Health care providers need to be with patients, serving their needs and the needs of their families and community. While absolutely essential to a well run practice the tension between the writing and publishing a newsletter and patient care, the newsletter soon loses the battle to the needs of patient care. We Make Patient Education Easy! Our service, LiveIt! Lifestyle provides your office tools to make starting your newsletter service both online and offline easy and affordable. We have also created proven tools to bring patients back into the office and educate them while at home and sitting in the waiting room. We have written (so far) 32 Nutritional Lessons (or Newsletters) that are personalized for you and your practice. These Nutritional Lessons/Newsletter's can be used in many different ways; print them as handouts, email them, or reference them on your website with our web module. We believe that a well educated patient shares their experience and their knowledge with family and friends, and we provide ways to do that the old fashioned way ofcourse but also give you the tools to the the internet bring your message to more people. "Wow, this makes it easy! The LiveIt! Lessons are personalized and patients read them, digg them, and pass them on to their friends via Facebook or whatever. AND they are learning this important health information. Thanks for setting this up." "The New Office Integration Manual is so GREAT! I have read the older manual and you know in our consultations you cover this – but the new manual is so clear and concise and to the point I am really getting it! I love it! I need it and here it is. Thanks again. Dr. L.E." "I was thinking about how far we have come since we started working with you and how I might capture that in words for a testimonial. 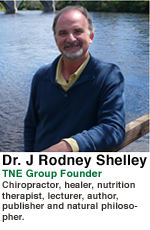 Minus all the details the one thing that I would like people to hear is this, “Rod Shelley is a Catalyst for Success!!!”. Sincerely, Dr. Eric Snow. "Reading Patients Speak makes every patient a better patient. That's because it makes Nutritional Therapy simple and easy to convey to others." Dr. Robert Curry.